Do you have a passion for health, fitness and exercise and want to share it with others? Do you want to motivate people to get fit and healthy? Personal fitness training is the career for you. There are many schools that provide the programs to catapult you to the fitness career of your dreams. After graduating with a personal training certification or fitness degree, you will be able to share your knowledge to get people fit and healthy. As a personal trainer you can lead group exercise programs, provide one-on-one training and create weight-loss and workout plans for clients. 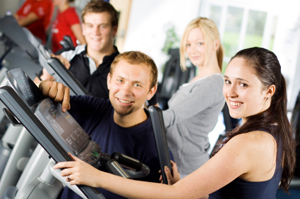 As a fitness trainer with a certification, you could be able to work in gyms, health clubs, rehabilitation centers. Create your own fitness training business or specialize in weight training, yoga, Pilates, nutrition, spin, or aerobics. Take your stride to become a personal trainer. Find out more about these great fitness training programs and schools today!